Otoplasty, also known as ear pinning cosmetic ear surgery, can correct a variety of ear-related complaints and enhance you or your child’s self-esteem and confidence. This kind of facial plastic surgery can repair or correct over or undersized ears, position the ear or ears closer to the head, improve symmetry between the ears, or improve the appearance of large, small or stretched earlobes or torn earlobes. It can also correct “lop ear” (when the ear’s upper tip folds down and forward) or “shell ear” (when the ear’s natural folds, creases and curves are missing). Otoplasty is commonly performed on children 4-15 years old whom might face ridicule because of a congenial anomaly such as the over-sized or protruding ears. However, ear surgery assists people of all ages. 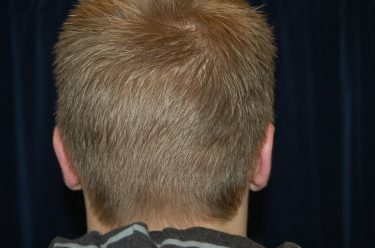 Commonly men as they lose their hair may notice the ears more and women whom like to wear their hair back may also appreciate less prominence of the ear as well. Ear pinning or otoplasty is commonly done in adults and no additional risks are introduced when the surgery is performed on adults. In fact, the otoplasty surgery can commonly be performed under local in adults in the clinic. It occasionally is combined with facelift surgery or rhinoplasty. If your ears are a source of embarrassment or lower self-esteem, or cause you to wear only certain hair styles or even hats you may want to consider ear surgery as a way to gain confidence in your appearance. Torn or gauged ear lobes can be closed or repaired. Using standard plastic surgery techniques, our experienced plastic surgeon, Dr. Charles Perry, can close the enlarged lobule or ear lobe by freshening the skin inside of the ear lobe and closed it to the opposing side. Often some excess skin is removed to keep the lobe looking normal and not droopy. Several stitches are required and a straight line scar is usually all that is left. The procedure is done in the office and requires about an hour to perform. Ear surgery can help a variety of people, including children who have large or protruding ears and adults who have suffered injury to the ear or otherwise wish to improve the appearance or position of their ears. Individuals under four years old – The ears are not fully grown at this time. Individuals with certain medical conditions – Inform Dr. Perry of any health problems you have or medications you take. Bulky bandages will need to be worn after ear surgery; these will be replaced with a lighter headband-style bandage after a few days. Children may return to school seven days after surgery but must be careful about playground activity. For a month, sports and any activity in which the ear might be bent must be avoided. Please plan ahead when undergoing ear surgery, and plan according to your child’s schedule. While ear surgery can help improve symmetry if one ear markedly differs from another, and the surgeon will do his best to achieve symmetry when operating on both ears at once, perfect symmetry following any type of ear surgery is an unreasonable expectation. Like facelift, blepharoplasty, and other facial procedures, ear surgery is performed as an outpatient procedure. When performed on small children, ear surgery is typically completed under general anesthesia; on older patients, local anesthesia coupled with sedation usually suffices. There are several ear surgery techniques, and the selected approach is largely dependent on the nature of the aesthetic problem. In general, the surgeon begins otoplasty by making a small incision along the back of the ear, exposing the ear cartilage. The surgeon then reshapes the cartilage, positioning it toward the head to make the ears lay flatly against the head. In some cases, a large piece of cartilage will be removed, or the surgeon will use stitches to fold the cartilage back on itself, reshaping the ear. Often, the surgeon will use permanent sutures to help the ear hold its new shape. 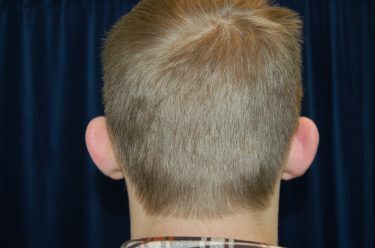 The scar, located in an inconspicuous spot at the back of the ear, will fade to near-invisibility over time. Several common ear pinning surgery techniques that plastic surgeon Dr. Charles Perry utilizes is the incision- less otoplasty, the double incision otoplasty and the single incision otoplasty. The incision-less otoplasty is used when only a minor correction is required to the ear fold or anti-helical rim. Permanent sutures are used to hold the ear in position and are placed without an incision. Some scoring of the cartilage is also required. The double incision otoplasty is the most commonly utilized technique at Chrysalis Cosmetics. It allows for the most precise correction of all of the components of prominent ear and requires a hidden incision on the back and one on the front of the ear to address the excess ear cartilage and skin. On occasion, a single incision in the back of the ear can be utilized to correct minor irregularities and pin the ear. Otoplasty requires a variety of techniques to address the many irregularities that can exist. Ear surgery is typically a highly successful surgery with a low incidence of complications. However, complications are possible with any surgical procedure. This can spur the formation of scar tissue. Infection is usually managed with antibiotics and, in rare cases, further surgery. In some cases, the new position of the ear is maintained by permanent sutures, and these can poke through the skin and need to be removed. Reactions to anesthesia are the most common surgical complication. They can be serious and in extreme cases even life-threatening. While most blood clots disappear on their own, some may need to be drawn out with a needle. To guide you or your child’s ear surgery, we have prepared this comprehensive list of pre- and post-surgery instructions. Review the instructions before surgery, and print them out and bring them along on surgery day.